If you’re like me, you always thought you had seen Hello, Dolly!. Sure, you listened to the cast album zillions of times. Sure, you’ve seen the movie … well, sometime in the past, and you thought Barbra Streisand was too young for the part, and why would she want Walter Matthau anyway? But you didn’t remember it that well. 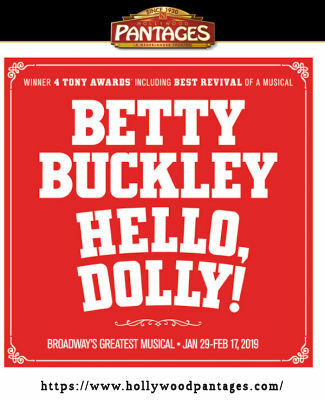 But when did you last see Hello, Dolly!, well done, on an actual stage? If you’re like me, it was, well, I can’t remember if I have. Seeing Betty Buckley (FB) in Hello, Dolly! Sunday evening at the Hollywood Pantages (FB) was a revelation. It was a reminder of what theatre was in the golden age — the days of Gower Champion and David Merrick. It was also a reminder about how what you might remember as a fluff of a show — a star vehicle — has surprising relevance over 50 years after it first premiered. For those who don’t remember the story, it is based on Thornton Wilder‘s 1938 comedy The Merchant of Yonkers, which Wilder revised and retitled The Matchmaker in 1955. In 1964, it was adapted into a musical by producer David Merrick, with lyrics and music by Jerry Herman and a book by Michael Stewart. It tells the story of Dolly Gallagher Levi, a widow whose business since her husband died is “meddling” — matchmaking, among numerous other businesses. She has recently arranged a match for Horace Vandergelder, a half-a-millionaire in Yonkers, but aims to get him to change his mind and marry her. She’s also helping Ambrose Kemper to marry Vandergelder’s niece, Ermengarde … but to do so she’s got to overcome Horace’s reluctance because the young man has no income. Vandergelder is planning to propose to Irene Molloy, a hatmaker in New York. In parallel, Vandergelder’s clerks also engineer a trip to New York for adventure. They run into Molloy’s shop, where they get involved with Molloy and her assistant, Minnie Fay. That gives you the basics: you can find a detailed synopsis on the Wikipedia page. The story itself — unsurprisingly — is silly and a bit dated. The behavior reflects the attitudes of the 1890s, not today. But there are some really important messages in the story that I never realized, and that are really, really important. First and foremost is Dolly’s message, best captured in “Before the Parade Passes By”. Dolly had been in a deep funk after her husband died, and that become clear as the musical progresses. But what is clear is that the incidents shown in the musical reflect a turning point for her: a decision to get out of her depression and jump back into life. That’s a very important message — perhaps one that wasn’t as strongly recognized in the 1960s. Far too many people are depressed, and the best way out of that depression is to go out and live. To return to life. To do it before the parade — and life — passes you by. The second message comes out at the end, and seems even more relevant in the days of Donald Trump. The goal of money is not to hoard it; it is not to be like a dragon pinching every penny (even that one in your pocket). Money is like manure, as Dolly notes: it works best when you treat it like fertilizer and spread it around, enabling those around you to grow. This is such an important lesson — and one that our current administration could well learn. The messages in Dolly are made stronger with the right casting. Having seen Dolly now, I can say that Streisand was clearly too young for the part. So was Channing in 1964. So were many of the other actresses playing the role then. Dolly needs to be an older woman who is clearly returning to life, not a younger women with her life before her. This is one reason why this revival has worked so well. The women playing the role on Broadway — Midler, Peters — were the right age. Betty Buckley is the right age — and is an example of how older women are coming into their own, as the LA Times noted. So before we get into the nuances of the performances of this cast, let me say again: Go see this show. This isn’t your father’s or grandfather’s creaky musical. If you watch closely, you’ll see a message that is truly relevant today. Under the direction of Jerry Zaks and the choreography of Warren Carlyle (with Stephen Edlund (FB) [Assoc. Director]; and Sara Edwards (FB) [Assoc. Choreographer], and David Chase [Dance Arrangements]), the production scintillates, shines, and entertains tremendously. This team seemingly permitted the cast and ensemble to explicitly have fun, to play the characters as characters (i.e., not hyper-realistic), and to just go with it. I have no idea whether the original director and choreographer Gower Champion permitted this, but it made this staging just a real joy to watch. I was just smiling through the entire show — it was that much fun. In the lead position was Betty Buckley (FB). Before I saw the show, I was unsure whether she would be able to make this show her own, but from the moment of her entry — she did. She played to and with the audience; she was clearly having fun and was bringing the audience along for the ride. Buckley’s Dolly seemed to have two sides: the side that was the acknowledged character in the story, and the side that was the character in the show, knowing it was the show. Other characters did this as well (at times), encouraging the audience to go along with the gag — a “we know this is silly, but let’s have fun together”. Buckley’s voice handled the music well — although truth be told, this isn’t a show that requires a spectacular singing voice for Dolly, just a loud one. After all, Channing’s voice during her (shall we say) extended run was never the greatest (her voice was better in Gentlemen Prefer Blonds), but the character made up for it. Buckley had the voice, and the character. Buckley also had the age, which gave her character the right gravitas and experience for the role to actually make sense. I don’t think this was the case in the 1960s original, when Channing or Streisand were in their 20s and 30s (Merman and some of the others did have the right age, at that point). But in this revival, the age worked to the advantage of the character. Also super-strong was Lewis J. Stadlen (FB)’s Horance Vandergelder. I was never enamored of David Hyde Pierce in the role — he didn’t have the age, and the curmudgeon-ness was forced. Stadlen, on the other hand, brings that in spades. It’s like Pangloss was on stage (which he was). He has the comic timing, the playfulness, and the experience to do the role right. In many ways, he harkens back to the original Vandergelder, David Burns, who was an old man at the time. He also makes a believable couple with Buckley’s Dolly; not something you could say for all the various Dolly/Vandergelder actor pairings. In the supporting male positions were Nic Rouleau (FB, FB) [Corneilius Hackl] and Jess LeProtto (FB) [Barnaby Tucker]; the corresponding ladies were Analisa Leaming (FB) [Irene Molloy] and Kristen Hahn (FB) [Minnie Fay]. All had wonderful comic timing and expressions, and were strong singers and dancers. In particular, the comic playfulness of Rouleau was just a delight, and he seemed to take great joy in going above and beyond in the comedy department. Leaming found the right balance between being prim and proper and letting her hair down and letting the girl out. As for the other pairing of LeProtto and Hahn: LeProtto got the comedy and timidness of Barnaby well, and was an outstanding dancer in “Dancing”. Hahn caught my eye from the first moment she came on stage. She had the right aura of naive and nerd that made her pairing with LeProtto’s Barnaby work. All were strong. The third tier of characters were Garett Hawe (FB) [Ambrose Kemper] and Morgan Kirner (FB) [Ermengarde]. This were almost literally one-note characters — certainly for Kirner, who seemed to only screech as a character. But they were strong in their dancing during the contest, and provided the necessary humor. Rounding out the cast were the minor named characters (who were also part of the ensemble), as well as the unnamed ensemble members: Jessica Sheridan (FB) [Ernestina Money, Dolly Leviu/s]; Wally Dunn (FB) [Rudolph, Horace Vandergelderu/s]; Maddy Apple (FB) [Irene Molloyu/s]; Daniel Beeman (FB) [Court Clerk, Cornelius Hacklu/s]; Giovanni Bonaventura (FB) [Ambrose Kemperu/s]; Elizabeth Broadhurst (FB) [Irene Molloyu/s, Ernestinau/s]; Julian DeGuzman (FB) [Barnaby Tuckeru/s]; Alexandra Frohlinger (FB) [Ermengardeu/s, Minnie Fayu/s]; Dan Horn (FB); Corey Hummerston (FB) [Ambrose Kemperu/s]; Madison Johnson (FB) [Minnie Fayu/s]; Beth Kirkpatrick (FB) [Mrs. Rose, Dolly Leviu/s, Ernestinau/s]; Ben Lanham (FB); Kyle Samuel (FB); Scott Shedenhelm (FB) [Barnaby Tuckeru/s]; Timothy Shew [Judge, Horace Vandergelderu/s]; Maria Cristina Slye (FB); Cassie Austin Taylor (FB); Davis Wayne (FB); Brandon L. Whitmore (FB, FB); and Connor Wince (FB). Swings were: Brittany Bohn (FB) [Asst. Dance Captain, Ermengardeu/s]; Whitney Cooper (FB); Nathan Keen (FB); and Ian Liberto (FB) [Dance Captain, Cornelius Hacklu/s]. Of these, a few stand out: Jessica Sheridan, not only for her comic playfulness as Ernestina, but her joy as she moved in the ensemble; and Wally Dunn for the fun he had as Rudolph during the waiter’s gallop. Additionally, all of the ensemble should be commended for the fun they were having, and how that fun was conveyed to the audience. Musically, Jerry Herman’s music and lyrics were supplemented by the orchestrations of Larry Hochman. Music was realized under the music direction of Robert Billig (FB). The remaining members of the orchestra were (♯ indicates local musicans): Tim Laciano (FB) [Keyboard2, Assoc. Conductor]; Max Mamon (FB) [Keyboard1]; Rich Rosenzweig (FB) [Percussionist]; Jeffrey Wilfore (FB) [Trumpet1]; Jen Choi Fischer (FB)♯ [Violin, Concertmaster]; Grace Oh (FB)♯, Ina Veli (FB)♯ [Violin]; Ira Glansbeek♯ [Cello]; Michael Valerio (FB)♯ [Acoustic Bass]; Richard Mitchell♯ [Clarinet / Flute / Piccolo / Alto Sax]; Jeff Driskill (FB)♯ [Flute / Clarinet / Alto Sax]; Sean Franz (FB)♯ [Clarinet / Flute / Bass Clarinet / Tenor Sax]; Chad Smith♯ [Clarinet / Baritone Sax / Bassoon]; John Fumo (FB)♯ [Trumpet2]; Aaron Smith (FB)♯ [Trumpet3]; Charlie Morillas (FB)♯ [Trombone]; Juliane Gralle (FB)♯ [Bass Tombone]; and Mary Ekler (FB)♯ [Keyboard Sub]. Other music credits: Eric Heinly (FB)♯ [Orchestra Contractor]; Seymour Red Press [Music Coordinator]; Kimberlee Wertz [Assoc. Music Coordinator]; Emily Grishman Music Preparation [Music Copying]. Santo Loquasto did the Scenic and Costume Design. The scenic design was heavily traditional scrims and flats — no abuse of technology and projections here — with larger sets for Feed and Grain Shop, the Hat Shop, and the Harmonium Gardens. More spectacular were the costumes, with a remarkable use of color and bustles to provide a scenic rainbow on stage. In general, the scenic use of color in this show as something special. This was all supported by the hair, wigs, and makeup design of Campbell Young Associates. The sound design of Scott Lehrer was unusually clear in the Pantages space; it will be interesting to see how show sound evolves as musicals move to the Dolby. Natasha Katz (FB)’s lighting established time and mood well. Rounding out the production and creative credits were: Don Pippin [Vocal Arrangements]; Telsey + Company [Casting]; William Joseph Barnes [Production Supervisor]; Brian J. L’ecuyer (FB) [Production Stage Manager]; Karyn Meek (FB) [Stage Manager]; Amy Ramsdell (FB) [Asst. Stage Manager]; Allied Touring [Tour Marketing and Press]; Aurora Productions [Production Manager]; Neurosport [Physical Therapy]; and far too many producers and executive producers. If I haven’t made it clear by now, go see Hello Dolly! You’ll be glad to be back where you belong. Hello, Dolly! continues at the Hollywood Pantages (FB) theatre through February 17, 2019. Get your tickets through the Pantages online box office; discount tickets may be available through Goldstar or TodayTix. The Pantages has announced their 2019-2020 season, and it’s a good one. You can read my thoughts on the season here. This coming weekend is busy, with 1776 at the Saroya [nee the Valley Performing Arts Center (VPAC)] (FB) and then running over to Hollywood for Anna Karenina at Actors Co-op (FB). Presidents Day weekend brings The Joy Wheel at Ruskin Group Theatre (FB) in Santa Monica. The last weekend of February is our annual trek to the Anaheim Hills for Lizzie at the Chance Theatre (FB).